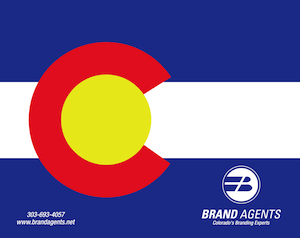 We here at BRAND AGENTS are extremely proud of our home state of COLORADO and the flag that represents us. You’ll notice the state flag incorporated into t-shirts, hats, mugs, key chains, food items and automobile signs wherever you go. Contact us for fun ideas to co-brand your logo with the state flag. We’re certain you’ll LOVE the results! For those out of state, we’re not limited to Colorado and would be more than happy to help you with your state flag, or perhaps a U.S. flag, for co-branding. BRAND AGENTS is a Colorado Native company and we’re proud. Let us help you show your state/U.S. pride as well! !